The big day was finally, here. Held at on 13 April, at the The Coliseum™, Hard Rock Hotel, Resorts World™ Sentosa , the day saw a nearly full house attendance, and one could definitely feel the excitement in the air and the adrenaline pumping in their ears. 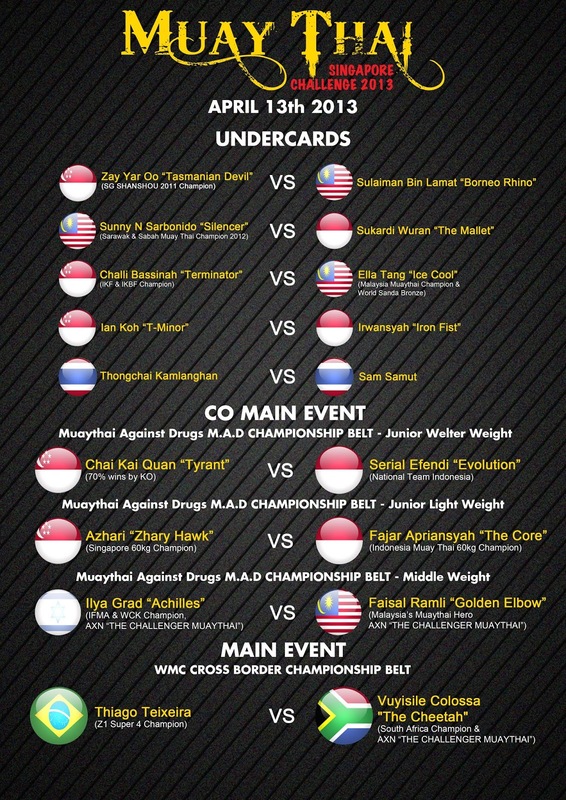 According to the fight card, a total of nine matches took place that night with five local fighters in the lineup: Mohd. Azhari, Zay Yar Oo, Ian Koh, Challi Bassina and Chai Kai Quan. A fight win would be determined through five match rounds (lasting three minutes each) by a verdict or winning by knock out. Before each start, I noticed interesting that each of the fighters will commence in a dance of some kind, perhaps for luck in the ring? I later found that they were practicing Wai Kru. A ritual dance carried out before the fight official commences, the centuries old tradition is meant to convey honor to the fighter’s teacher, Muay Thai and his country. Dancing in each direction of the ring, the fighter touches each corner post with a prayer, conveying respect to his opponent and the spirits. Below is a video of a standard Wai Kru dance. was only natural that when Kai and Ian took to the stage, I ditched all decorum and began screaming my support in a rather unlady-like manner. First was Kai, who went up against versus Serial Efendi (Evolution) from Indonesia. Kai put up a valiant fight, but Serial proved to be too much of an obstacle to overcome despite fierce and unrelenting attempts to break down his brick-wall like physique. I cringed and wince as Serial rained blow after blow while Kai tactfully tried to block. Eventually, the former struck an uppercut where Kai was blindsided and failed to react in time, costing him. Next up was probably the most harrowing fight put up by Ian against Irwansyah (Iron Fist) from Indonesia. The latter being towering and menacing, I felt a slight pang of trepidation for Ian, given his smaller stature and his health disposition. I was soon to be proven very wrong, as I watch the Peranakan fighter put up obstinately strong defenses and reserve, landing strategic blows when he saw chance and Irwansyah. Eventually, Indonesian went down after his blows got slow from the volleying battle and Ian struck in a hard but small burst of blows.The crowd went ballistic and so did I! With a tired smile, Ian retreated backstage with loud cheers ringing through the air. And who says women can't hold their own in a sport dominated by men? Singapore representative Challi proved to be a force to be reckoned with. Her stance tall and commanding radiated confidence as she executed swift blows. Her opponent, was Malaysian Ella Tang put up against her as best as she could, but was in comparison was lacking speed and made quick work of her competition soon after. Still, my hats off the two ladies and their remarkable dedication to the craft, and I personally went to offer my admiration to the both for a spectacular match. Lastly was the Charity belt that pitted celeb-status fighter Illya Grad against Malaysian Faisal Ramli, the one that many held bated breath for. Like a true pro, Illya worked his opponent to his advantage, drawing out only when necessary and overwhelming with sudden bursts of speed and offensive attacks. Needless to say, Illya emerged victorious and much of his fans and Muay Thai aficionados went wild, this author included. My first ever live fight event had not disappoint; it is both amazing and mind-blowing experience altogether. Doesn't matter if you are not a fight/ Muay Thai fan; live shows will just pull you into a whirlpool of emotions and you will find yourself sub-consciously rotting for the underdog, and experience that triumphant and excitement when they have won against the odds! If this is a sign of things to come, then I am definitely looking forward to the next Muay Thai Challenge!